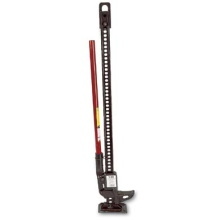 Approximate weight: 30lbs (14 kg) 4,660 lbs (2113.74 kg) rated capacity Climbing pins of specially processed steel with 125,000 PSI tensile strength and 100,000 PSI yield. Steel bar is manufactured of specially rolled extra high carbon steel with 80,000 pound minimum tensile & carbon .69 to .82. Steel handle of 14gauge high-yield structural tubing with minimum yield of 55,000 PSI. 1 5/16" diameter x 30" long. Features Every Jack comes complete with an adjustable top clam clevis for use in clamping and winching. Safety bolt is designed to shear at 7,000 lbs. 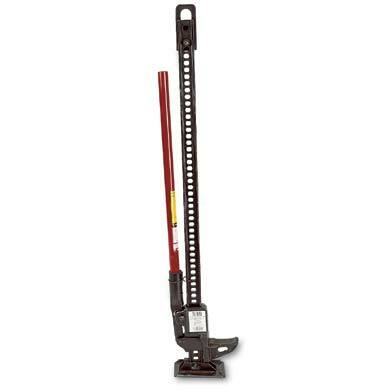 (3175 kg) For speedy disengaging, lifting unity automatically drops away when load is removed. 4 1/2" (11cm) long lifting nose for positive contact with load. Steel bar can be reversed for extra long life. Low pickup of 4 1/2" (11cm). 28 square in base plate.